| Beautiful film; Disney version pretty good. This may seem a rehash of the previous comments, but I only now got to see the Disney dubbed release. I am (overly) familiar with the Japanese version, and did not want to be burdened with the "star" American voices; my wife doesn't like foreign-language film, though, so I needed the English version. With the LD, I got both benefits without having to purchase 2 VHS versions, and got to do some interesting side-by-side comparisons- switching between languages, watching the Japanese language version with the sub-titles for the English version, etc. First off- this *is* Miyazaki, and *this* is animation. It is utterly beautiful, and the story is a wonderful one for both children and adults. There are very few people who will not be charmed by this... except maybe teenage boys, who don't want to be caught liking something so sweet. Otherwise, I can safely recommend any version to anybody. Miyazaki films often prefer to paint a scene with pictures and music, not words. The English translation is an egregious offender here; what in the Japanese version are vignettes and scenes that are wordless become in the English version open chances for Phil Hartman and Kirsten Dunst to wisecrack, chat, or what-have-you. I feel that this is due to Disney's belief that children in America must be entertained for every second of a movie, lest their minds wander off. Just as many people find Japanese dialogue to be grating on the ears, so do I find the English language voice actors to be grating. Actually, mainly just (the late) Phil Hartman. His nasal, loud voice just does not fit JiJi, a cute, diminutive cat. Kirsten does an okay job, although her voice sounds a wee bit older than Kiki's 13. Already being familiar with the film, I have to admit being disappointed with the English version... it's a necessary evil, and I'm glad that my wife can enjoy the film now; but I feel that no matter how well-intentioned, Miyazaki's vision was dimmed somewhat in the Americanization. If the only version to come out had been an English version, I honestly would have rather imported a copy from Japan than support Disney. All that being said, though, I would place the English-language Kiki far above most Disney efforts, and especially above Disney's modern efforts. 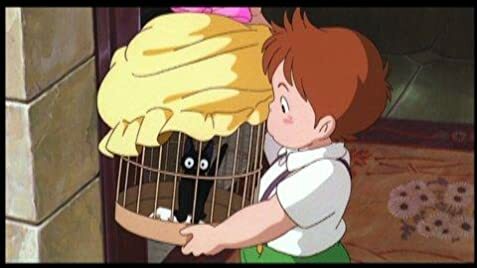 I sincerely recommend that everyone watch Kiki once; if you like it, try the Japanese-language version (Buena Vista has released a VHS, widescreen, sub-titled Japanese version. Thank you, Disney!) And if you are a Disney film fan, you owe it to yourself to see what the Japanese can do. The name of Osono's bakery, "Guchokipanya" is a Japanese pun made from the words "guchokipa" (Rock Paper Scissors) and "pan'ya" (bakery). The Disney dub refers several times to the airship as a "dirigible", which is correct, but also as a "blimp", which it isn't; it is a zeppelin, a rigid airship with an internal skeleton that holds it in shape, not a blimp, which is basically a big helium-inflated balloon held in shape by the helium. The denouement scenes of the film play out with the credits rolling ending with Kiki's parents reading a letter from her after the credits finish.